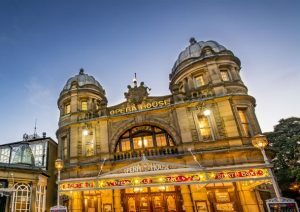 We are proud supporters of Buxton Opera House, Buxton’s wonderful Edwardian theatre and one of the country’s finest examples of Frank Matcham theatre design. We hold a discount card with Buxton Opera House and can get a 12% discount on up to 4 tickets for many shows. Please enquire if this is something you’d like to take advantage of. On selected days throughout the year, it’s possible to go backstage to discover the fascinating history of this fabulous building. Please note that the theatre is over three levels and the tours involve several flights of stairs.